This report, dated May 6, 2009, comes to us from Raja Shah, a fellow member of the International Colored Gemstone Association. The Taita-Taveta Districts (split in 2007) are approximately 200 km. northwest of Mombasa, in Kenya’s southeastern Coast Province. All photos are courtesy Raja Shah. 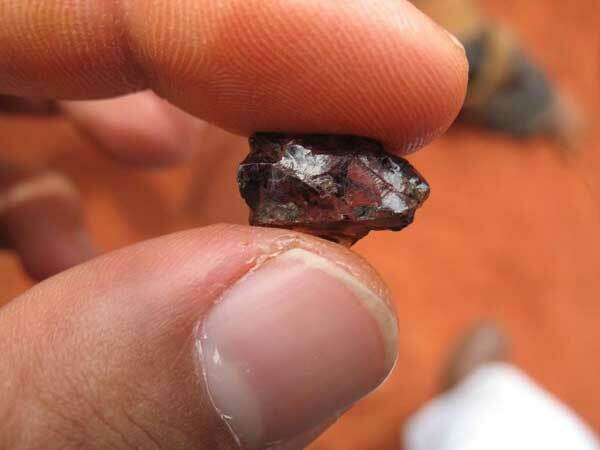 The New Year brought a new discovery to the Taita-Taveta area of Kenya: color-change garnet. 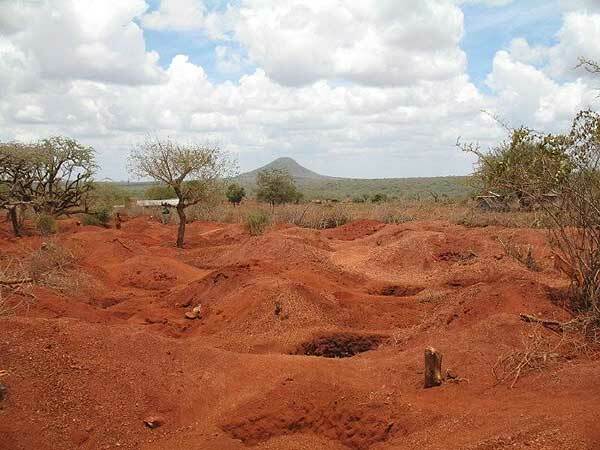 This mining area is known for the vast majority of tsavorite production in East Africa and also produces other gems including ruby, golden and chrome tourmaline, red garnet, apatite, etc. While digging a pit latrine in early January, a ranch hand came across some unusual looking stones just a few feet below the surface and showed them to one of the local gem brokers. What followed is the classic tale of mining rushes. Hundreds of small-scale miners descended upon the area from nearby mines and started producing material—the very best of which rivals the finest from Madagascar—changing from a teal (blue-green) in fluorescent light to pinkish-purplish-red in incandescent light. Colorado. A view of the color-change garnet mining area with its distinctive red earth. In the distance is the Mwambirwa forest area, which has been devastated by fire in recent years. The rushing miners proceeded to mine haphazardly on this private land, and even dug up a section of an adjacent road under which some fine stones were reportedly found. The landowner then brought in security forces to bring some control to the area, and the small-scale miners moved to an adjoining piece of land, where they are currently mining. Nearby claim-holders are also actively mining this material now. As anyone familiar with East African geology knows, when you strike a gem in a particular area there is a great likelihood of finding similar material in the surrounding area, albeit a very hit-and-miss process, given the tortured geology of the region. Comfort station closed for gleaning. 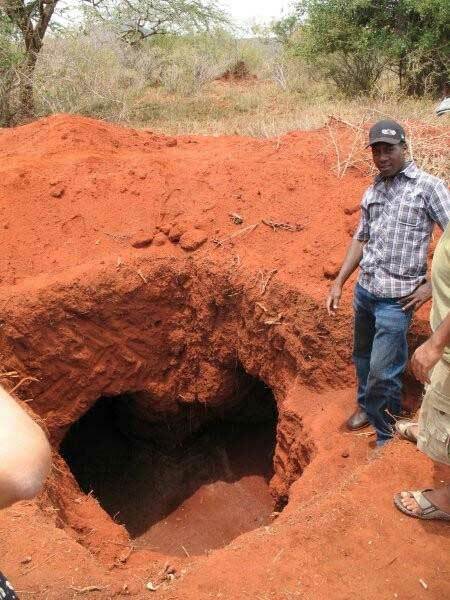 Entrance to a mine at Taita-Taveta. The original discovery was made by a ranch hand digging a pit latrine. There is a very wide range of colors being produced in this new mining area, from light brownish stones with little change, which is the bulk of the production, to the fine material with 100% change, which forms only about 5% of the total production. In addition, the vast majority of stones are very heavily included and unsuitable for fashioning into faceted gems, making it difficult to obtain clean stones with good change. The lack of water in the area (even worse with the current drought in East Africa) makes mining a very dusty and tedious process. The miners are unable to wash the gravels and better separate heavy materials from which gems can be extracted. Big. Clean color-change garnet material over 3 carats from Taita-Taveta is extremely rare. 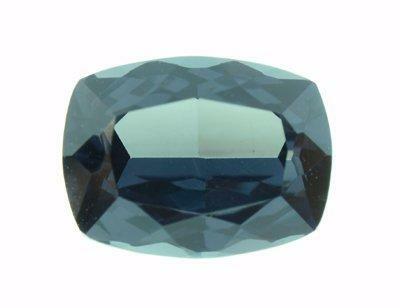 Due to the fantastic color-change effect in the best material many brokers mistakenly thought the material to be alexandrite at first and sold it for very high prices to over-eager buyers. While alexandrite fetches thousands of dollars per carat, color-change garnet can usually be purchased for a fraction of that. 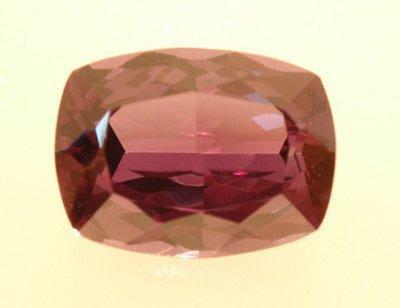 The field test between alexandrite and color-change garnet is generally very simple—garnet is singly refractive—which can be assessed with a simple dichroscope, while alexandrite is trichroic, showing three colors in the dichroscope. Bigger. This 5.33-carat garnet from Taita-Taveta exhibits the color change phenomenon found in the finest stones from the locality. Above: incandescent. Below: daylight. Buyers have now arrived from all over the world—USA, Asia, and Europe—driving up prices for the very best material. Sizes that can be cut from the better-color material are primarily below one carat, with material above two carats rare, and above three carats extremely rare. Since this is an alluvial deposit, mining can only be expected to last for a relatively short period of time. It is unknown if the primary deposit still exists, and even if it is discovered, mining that is likely to be far more difficult and expensive than this current strike. Interested? Pala can help you find the ideal color-change garnet for your collection or your client. Give us a call, or email us for more information.